Adequate airport capacity is crucial to allowing the global economy to grow. Present regulatory arrangements are not efficient because the airline and airport markets have changed enormously over recent years. There is scope to do much better.The challenge is to create conditions for efficient infrastructure development in a sector where in some circumstances some airports have market power and might abuse this position. It is important that regulatory intervention only occurs where it is actually needed as it is costly in terms of administrative effort and altering the market. All regulatory controls on the pricing of aviation services carry the risk of getting investment incentives wrong. 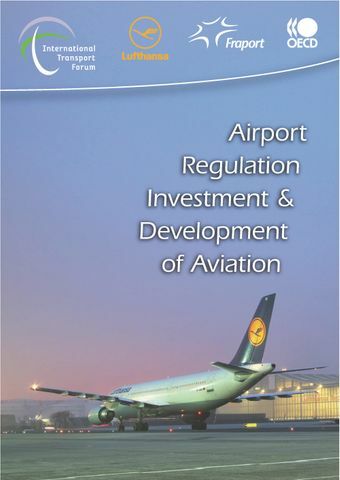 A number of regulators are beginning to experiment with this key control, with promising results.This report reviews recent experience with airport regulation on the basis of discussions at the International Transport Forum between leaders of airlines and airports together with regulators and economists. Liberalisation of aviation markets combined with privatisation of most airlines, and now many airports have changed aviation markets rapidly and profoundly. Regulatory models have tended to evolve more slowly and need reform if they are not to become a drag on global growth.